This spiraling wire cupcake holder or muffin stand is based on the commercial holders used for special displays. The techniques to make it are simple, and can be used for many other projects. If you want to learn to make the cupcakes that fill the miniature holder, you may also want to read the following instructions and reviews. Wire - you can used colored wire or plain metal wire, I used copper wire, but cupcake stands are more commonly made from aluminum or steel, so ordinary metal craft wires as well as decorative colored wires are fine. For a stand in 1:12 dollhouse scale I used 32 gauge or .2mm fine wrapping wire, or jewellery beading wire, and for the main part of the stand I used 24 gauge or .5mm wire, which would also be fine for 1:24 scale. For 1:12 scale larger gauge wire (22 gauge or .6mm) would be a bit easier to use. The rubber stamping guide has information on craft wire gauges if you need to check what wire you have. Cone shape - a bead or the end of a large barrel ball point pen will work well. You need this to shape even spirals of wire. Miniature Cupcakes or Muffins (fairy cakes) - needed to measure the size of stand you need. These instructions will help you make your own miniature cupcakes or muffins. The method of making simple spirals is very simple. You need to wrap your wire evenly around a cone shape, with equal spacing between wraps, remove the wire from the cone, flatten the coils together with pliers, and bend the center of the spiral, tightening or loosening the shape. To start making the miniature cupcake stand, practise on the top layer spirals. You will need four which are the same size, and you will need to fit them to your cupcakes or muffins, checking that they will hold the cupcakes in place when you pull up the wire on the sides of the cupcake. Cut the Wires - For a cupcake stand in 1:12 scale, I cut four wires 2 1/2 inches long from my heavier gauge (22 or 24 gauge) wire. Start the Wrap - To make even spirals, start wrapping your wire around the top of your cone shape, roughly 3/8 to 1/2 inch from the end of the wire. See how the wire is wrapped around the tip of the ballpoint pen in the photo above. Flatten the Spiral - Flatten the spiral between the blades of your pliers (see next step) and tighten the center of the wire. (See step following). The object of making these first spirals is to make even spirals of wire, which are wide enough for the base of a miniature cupcake to sit in the spiral when it is pulled up the sides of the cupcake. (see photo). Test The Size of Your Spirals With Your Cupcakes - I made my spirals just over 1/4 inch in diameter, which allows me to pull up one section of wire all around the base of my cupcakes. If your spirals are too small for your cupcakes, you may need a wider diameter cone to wrap them on (try a bead, or a nail punch) or you may need to cut a longer piece of wire and wrap it so the loops are further apart. Experiment until you can make a spiral the right size. To get even sized spirals of wire for miniature or jewelry projects, wrap your wire neatly over a cone shaped form. Here the form used was the end of a fat ballpoint pen, but you can use a carpenter's metal nail punch, a strong bead, or any other cone shape to get an even spiral. Make sure you keep the wire wraps and even distance apart, leaving at least twice the width of the wire between wraps for a tight spiral, wider for a loose spiral. I wrapped my wire on my pen so that there was 1/8 inch between each wrap of wire. When your wire is neatly wrapped on your form, remove the wire from the form and flatten the spiral by gathering up the coils of wire between the jaws of your needle nose pliers as shown in the photo. You will end up with a neat spiral of wire. The final product may not yet look like the finished spiral in the photo on this page, to view how to tighten (or loosen) the spiral, see the next page of these instructions. To finish the inside of wire spirals, you may need to make a tight loop in the center. Do this by twisting the loose end of the wire which is in the center, around the end of your needlenose pliers, then remove the pliers and flatten the spiral again if necessary. If you tighten the spiral too much while you do this you may pull it out of shape. If that happens, insert your pliers in the small loop you just made, and push the wire back in the opposite direction to open up the spiral. Try to make your spirals as even as possible. For the top layer of the miniature cupcake stand, make four spirals sized to fit your cupcakes, with a straight end coming off the outer edge of the spiral which is roughly 1/4 to 1/2 inch long. Take the straight end and use your needlenose pliers along the length of the end, bending it down at right angles away from the spiral as shown in the photograph. To make the top cupcake holder and the main spine for the miniature cupcake stand, cut a piece of your heavier guage wire (22 or 24) which is five inches long. Starting with a free end of the wire at the widest part of your spiral former, wrap the wire down the form as outlined for making even spirals. For this top cupcake holder, the main wire will exit the spiral in the center of the spiral, forming the main stem for the rest of the cupcake stand. Flatten the spiral as outlined in earlier steps, and tighten the center of the spiral to make a neat circle, with the wire heading straight down through the center. Try very hard to keep the wire neat and without tiny bends. Bend the end of your fine beading wire (or 32 gauge wire) to make a 90 degree bend, leave it on the spool it is wrapped on. You only need about 1/8 of an inch of bent wire. Hold two of your four wire spirals on opposite sides of your top wire spiral, roughly 1/4 to 1/2 inch down from the top spiral. You want to set this first layer so there is a bit more than the height of a cupcake between the top and this set of cupcake holders. Lay the short end of fine bent wire so it runs down the stem of the cupcake holder, just like the straight ends of the spirals for the first layer do. (see photo) Begin to wrap the fine wire tightly around the two spirals, covering the end of the fine wire you placed along the stem as you wrap. Wrap the fine wire twice around the stem to hold the first two spirals in place opposite each other. Now add the two other spirals evenly between the first two, and wrap the fine wire over the straight ends of the wire from those spirals, attaching them tightly to the main stem of the cupcake holder as shown. Keep wrapping until you have at least 1/2 inch of stem wrapped with wire. Make sure your first layer of spirals are held securely. Set this assembly aside and proceed to making the sections for the bottom layer and the feet. To form the combination spirals for the base layer and the legs of the miniature cupcake holder, cut four lengths of wire 5 inches or 16.5 cm long. Form a spiral on one end as you did for the top layer of the cupcake holder, starting to wrap your wire from the thin end of the cone form and leaving the extra wire to come off the wide end of the spiral as shown in the photo. Flatten and finish the center of the spiral. Leave between 1/4in (.6cm) and 1/2 inch (1.2 cm) of wire coming off the spiral to hold the spiral out from the stem of the cupcake holder. You want the bottom layer of cupcakes held out further from the center than the layer of cupcakes above them. Bend the wire down 90 degrees as shown in the photo. Measure half an inch (1.2cm) down the wire and bend it at right angles again (see photo). Wrap another small spiral from the free end of the wire as shown, making the spiral at right angles to the cupcake holder spiral above it. (see photo) This spiral will form the top of the cupcake holder legs. You will need to make four legs, and four single spirals which have the same distance between the spiral and the first bend, and a length beyond the bend of 1/4 to 1/2 inch. These second set of four spirals will not have legs, and will be much more like the upper layer spirals, except the length of wire between the spirals and the bend must match the spirals made with legs. You can lay them on top of the legs to check the distance as you make them. Fit the four sections with the spiral legs around the main stem of the cupcake stand, with the leg spirals facing up. Wrap the fine wire around them below the first bend, around the straight section above the legs, wrapping the sections two or three times to secure them in place. Trim the central wire coming down from the top spiral, so that it does not protrude any lower than the point where the legs leave the main wire. Now add the remaining four single spirals without legs, fitting these in place between the spirals with legs. Wrap the entire assembly tightly all the way down the center straight section, and end your wrap at the point where the legs head out to the final end spirals. Cut your wrapping wire roughly 1/4 inch away from your final wrap, and bend it over so you can insert the loose end up inside the wrapping you just finished. Take the doubled wire (the end you inserted and whatever isn't wrapped yet) and finish the wrapping around the bottom of the stem to cover the end of the wrapping wire. 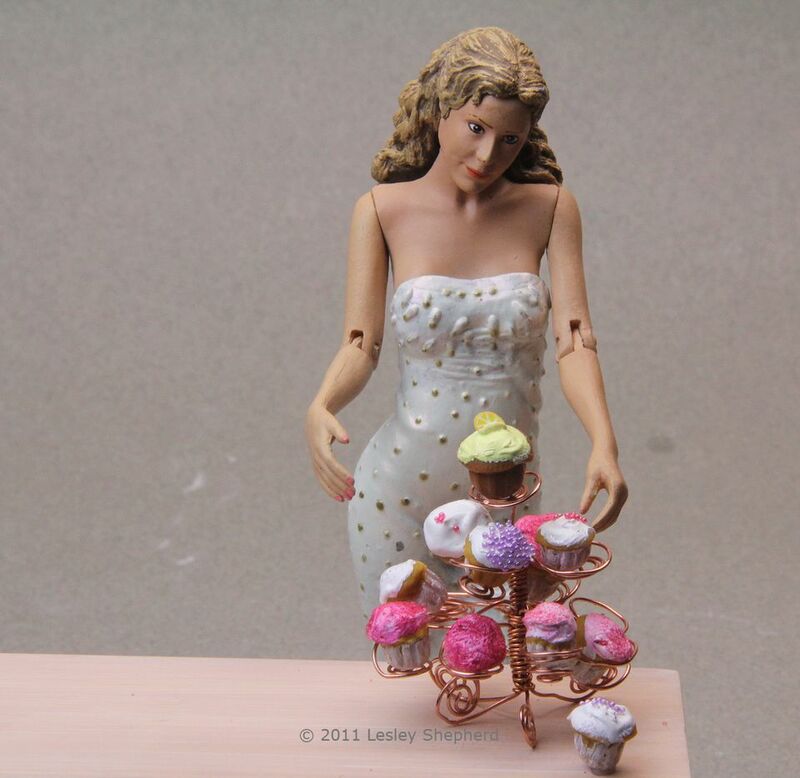 To finish the miniature cupcake stand, straight out the main stem and set it on a flat surface. Adjust the legs so that they hold the stand upright. Use tweezers to gently move the cupcake holders into position. There will be one cupcake holder on the top, four on the first layer, and eight on the bottom layer (the stand holds a bakers dozen(13) cupcakes or muffins). Set the cupcakes or muffins you want to display into the stand beginning at the bottom layer and working up.The easiest way to set the cupcakes on the stand is to place a cupcake in the center of a spiral and gently pull up on the outside wires until the cupcake is held securely by the wires. When you have all the cupcakes on the stand, gently twist the wires so the top of the cupcakes lean slightly out to show off any decorations.